Being young in the war years. The school year has begun again. I hear my mom shouting that I have to get up because I am going to be late and I can’t help but whisper that I procrastinate on purpose. It is just that thinking of doing my homework and presenting exams makes me yawn. And also half of my friends are fighting in a war on the other side of the world. I have a basketball game soon though; I am actually kind of excited about it. I have been named secretary of the basketball team. That is the one thing that makes me happy right now. My attitude towards school bothers me a bit. I remember how much I used to enjoy it, that carefree feeling that I had. I miss my friends. I can remember how easy it was to be happy, and even then we complained about the must mundane things, like how a girl didn’t fancy me, or how my mother wanted me to help her chopping wood. I long for those days. Everything changed so quickly. As I leave my house I see my mother staring at me through the window. She does that a lot lately; she looks at me when she thinks I don’t notice, as if she feels she will lose me at any moment. 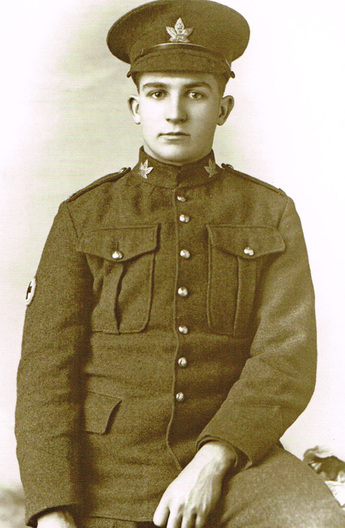 In my first block today the Principal informed us that Mr. Macdonald, our French teacher, enlisted yesterday to the 47th Battalion of the Canadian Infantry. My heart palpitated with patriotism when I heard the news. Mr. Macdonald is an incredible master; he has provided excellent advice, and is always willing to help his pupils. Even if his loss makes my heart depressed, I wish him success in this new stage of his life. I realize that my turn to enlist is coming soon. I am now seventeen and the army needs more young men. I recently heard rumours of conscription, but I will volunteer; I consider it my duty to fight for my country. I will wait to enlist after the Christmas holidays so that mother and father can be calmer, and I can enjoy their company as much as it is possible. On my way back home I stop to buy a piece of bread for my mother. I know about the scarcity of food and money, so using some of my savings to help at home is the least I can do. My best mate, Mark Berton, left to serve in the Canadian Infantry four months ago. I have not received a letter from him in one month. I deeply regret not enlisting at the same time than he did. As he is only one year younger than me, I feel an enormous responsibility for his well-being. I am scared, although I would never admit it. It is now July 1916; I have now been overseas for four months. Mark is dead. He died two months ago. War is very different from what I thought it would be; back at home everyone told us that we would be heroes -- that we were fighting with honour and glory. We are not heroes; there is no honour in killing innocent people. We should not be fighting this war. I have been appointed a sniper. I know I will die but I do not fear death. I am prepared. I hope Mother gets to read this someday. I am fine Mother, I will be fine, I will rest and be at peace. Please Mother; do not feel guilty for having joy in your life after I am gone. You deserve it. I do not know with what purpose I wrote this diary, perhaps it was my way of being free inside this prison that war has been.